This morning I woke up a lot earlier than normal to get to Jordanelle by 5am. I wanted to do a longer swim today, and had to be done by 7:30. When I pulled in, Jim had just parked. Goody, Ashley and Chaz were right behind him. It was a pretty good little group for that early in the morning! My goal today was to swim 3-4 miles. The water felt great! When I looked at my watch later, it said 73.5 degrees. It was very comfortable. It was hard to see the buoys on the first lap. I had lost track counting them and had to stop at each one towards the end to see if I was at the last one. 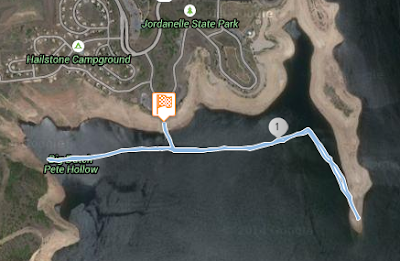 From there I swam out the peninsula and then back the way I came to the opposite end of the buoys. I saw Tim along the way and said "hi". I was kind of dragging towards the end and thought about just calling it good. I decided this was a mental training day and I was going to stick it out. I swam in to the ramp and got a drink. I finished my first lap in 1:04. I saw Goody on my way back out. He wasn't having a great day either and said his arms were tired. I think he ended up calling it good at that point because I didn't see him again and his car was gone when I left. There was a bit of chop on the way out on the second loop, but nothing too bad. By the time I got the end of the peninsula, it was back to being pretty calm. Sometimes I get stuck in the trap of just picking an easy pace and plugging along until I hit my target distance. It's fine to do this once in a while, but if you are looking to increase your speed, you need to be doing intervals and doing more than just swimming at an easy pace for miles. I think I'll do another post on how to make your open water training swims more effective, stay tuned. Anyway, I decided I would push the second loop and see if I could negative split the first loop. It was a good thing I took a drink at the ramp at the end of the first loop, because it started kicking in and I was feeling pretty good again. I saw Tim again and stopped briefly to say "hi" again. I wasn't sprinting on the second loop, but I was pushing myself at a faster pace. I had counted my strokes between buoys on the first lap and my stroke rate was higher on the second loop. 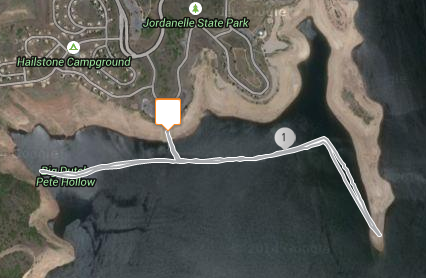 When I swam into the boat ramp for the second time, I stopped my watch at 59 minutes. Nice! I reset my GPS between each loop because I wanted to measure how far one loop was. Each L-shaped loop ended up being about 1.95 miles. I'm glad I decided to keep going this morning. It felt great to push through my negative thoughts and then to negative split the second loop.